“Chess legend Bobby Fischer shouldn’t be exempted from Japan’s rule that foreigners who are ordered deported must be sent to their homeland”, Japan’s top immigration official said Tuesday. Fischer and his supporters had asked that he be allowed to go to Iceland, where he had been granted a special passport for foreigners, instead of the United States, where Japan has ordered him sent. 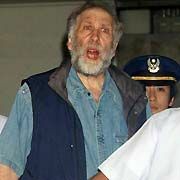 Japanese authorities have detained Fischer since July for allegedly trying to leave for the Philippines on a revoked U.S. passport. Under Japanese law, a foreigner may only be deported to a country of which he or she is a citizen unless the foreigner is recognized as refugee under international law or is exempt for other special circumstances, said Masaharu Miura, the head of the immigration bureau at Japan’s Justice Ministry. “This case is not an exception,” Miura told a parliamentary committee Tuesday. The U.S. has sought Fischer, on charges of “violating international sanctions against the former Yugoslavia”, as well as income tax evasion charges. Fischer became the first american to win the World Chess Championship in 1972, against the Soviet Union’s Boris Spassky. Stripped of his title for not defending it against Anatoly Karpov in 1975, Fischer remained a veritable recluse, until surfacing in 1992, lured out of “retirement” for $1,000,000 to play a rematch against Spassky. Unfortunately for him, the match was to take place in Sveti Stefan and Belgrade, Yugoslavia. Warned of the consequences, Fischer spat on the State Department’s edict at a press conference and proceeded to defeat Spassky in what many considered to be a lackluster affair. Fischer has denounced the U.S. deportation order as politically motivated. He has tried to renounce his U.S. citizenship and has applied to marry Miyoko Watai, a Japanese chess official. Some of Fischer’s Icelandic supporters have campaigned to help him out of gratitude, for putting Iceland in the global spotlight with his 1972 match against Spassky. Japanese Foreign Minister Nobutaka Machimura rejected a suggestion that Tokyo might be pursuing its case against Fischer due to pressure from the United States. “I don’t think the Justice Ministry is interpreting the law out of consideration for the United States,” Machimura said. In this recent climate of Baseball Steroid Hearings, and 11th hour legislation over the Schiavo affair, unlike Jenkins, it’s difficult to imagine the tragic Fischer receiving only a slap on the wrist.